FINALLY We're back in stock! After experiencing his own radical transformation, Drew Canole has dedicated his life to helping millions of others lose weight and reach optimal health, through the power of juicing vegetables and Superfoods. Will you be next? The best part is, organifi green juice has just made this faster, easier and absolutely DELICIOUS! For more exciting tips on reaching your health, fitness and lifestyle goals, you can catch Drew on his popular blog show at “www.FitLife.Tv”. Contact the Organifi team by calling 760-487-8587 Monday through Friday between the hours of 10:00am and 9:00pm Eastern Standard Time. We will gladly provide you with our return address, so as not to waste any materials, and a return confirmation number. This is an easy and effortless process. Return the empty canister, the Organifi invoice that received, and the confirmation number you have been assigned. It is your obligation to pay the return postage, and we do recommend you opt for tracking and confirmation numbers for verification and efficiency purposes. Note: We must receive the canister within 60 days from the date of original purchase for the refund to be valid. We can’t allow resale of Organifi products, so empty bottles will be refunded only after sufficient time has passed for a single customer to drink Organifi as directed. These guidelines were created to keep you satisfied, while at the same time ensuring we can continue to provide a quality product to other happy customers for years to come. Returning Organifi without complying with our policy will unfortunately deem your transaction non-refundable. After complying with the steps above, please allow adequate time for shipping, quality control, and communication with credit card companies and banks as you patiently await your refund. One of the most overlooked foods in our modern diet is fruit. We all know we should be getting more of those high-quality fruits in our lives, but we just can’t seem to do it. How many times have you bought a bag of apples or oranges only to let them go to waste in your fridge? Many people turn to juicing, without realizing that juicing fruits mostly reduces them down to their most sugary form... which is about as healthy as a large soda. However, there are AMAZING superfoods and super-fruits out there that can deliver the vitamins, minerals, and micronutrients our bodies need to feel young and energetic. These antioxidant-packed ingredients can work wonders on metabolism, as well. Hint: When you see RED pigmented plants: Think metabolism & SKIN health! As you can see: Organifi Red Juice is a miracle. I’m extremely proud. It’s loaded with organic, premium fat-loss nutrients. It’s overflowing with skin strengthening antioxidants from faraway lands. It’s tailor made. See, women and men much like YOU gave me the idea! So, by popular demand, I squeezed 11 ingredients for anti-aging AND fat loss into one glass. Are you ready to try it? So here it is. This ruby-colored punch is super easy to remember. It’s the simplest way to bump up your metabolism AND even strengthen your skin in one swoop. Just make one tiny change: Drop a bright red scoop of this mix into some water, and take a few sips each morning. It’s just $1.98 per day. That’s less than the cost of a coffee shop stop. Plus, it’s 10 times more nutritious than coffee! Now imagine this: What if you drank 11 metabolism-burning, anti-aging superfoods each day?! Think how different would you feel and look in just a short time! Come join the rest of us. Start seeing the results today! Breathe deep. You don’t have to rush into a decision now. Just try the Red Juice first. Put me to the test. See if you like the tart, sweet flavor. Wait till you feel the “warming bump” in your metabolism. Order today, and you’ve still got four weeks to think about it. Decide when you’re ready. I’ll still give you a full 100% refund of every single penny. You might think: “What if some people guzzle the whole jar, and still ask for a refund?” Yes, you’re right. I’m sure that happens. It’s okay with me. I give a full refund to any woman or man who asks. All feedback means a lot to me. It helps me make better juice for you next time. So, if you care about your time: I’ve already done the dirty work. I’ve met with doctors. I’ve met with clients. I’ve screened nutritionists, farmers, and even medicine men (and women) from distant countries. I researched the superfood herbs from Asia which “bump up” your metabolism. I located exotic roots and wild-berries from South America that heal and strengthen human skin tissue. Then I bargained. I struck deals with farmers and planters. It wasn’t easy. 100% USDA Organic was a must-have for every premium morsel. I believe you deserve the best. Finally, we mixed in some sweet monk fruit juice (just one crystal-clear drop.) We squeezed it all into a small jar that you can place in your kitchen cupboard at home. So you be the judge. Drink it in the morning for a while. Use it for a few weeks if you like. If you decide you don’t like it, I’ll give you ALL your money back. Every last penny… even if you drank it all. No questions asked. It’s absolutely risk free. You’ve got nothing to lose. That’s my 100% guaranteed risk-free trial. Click below. Try it today. Organifi Red has become my go to drink every single day!It is super light, crisp, and ultra refreshing. My favorite way to drink it is before a workout. I can’t imagine going back to my previous “pre-workout” supplement now that I have this super-energizing all organic, natural, superfood blend to boost my workouts and make me feel incredible. I am absolutely hooked! Individual results may vary. "I love red juice! It's a fresh, fruity powerhouse of nutrients. I can feel my cells waking up as soon as it hits my tongue. I definitely enjoy the clarity and energy that come from it. It's something I look forward to everyday." Individual results may vary. 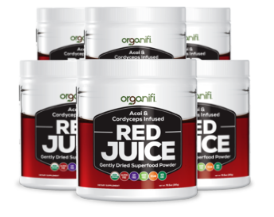 "Organifi Red Juice has a crisp and delicious taste that caught me by surprise! I love the natural feeling of alertness and clarity that it gives me throughout my day!" Individual results may vary. Organifi Red Juice is delicious. It was fruity but not overwhelmingly sweet! I could easily drink this every day for pure pleasure without feeling the task of making sure I consume my vitamins. I am LOVING the energy and mental clarity! Individual results may vary. Try it out for 30 days and if it doesn’t work for you, you’ll get your money back! There’s absolute no-risk in giving it a try. America’s favorite fruit! Strawberries pack a punch with collagen firming compounds. Flavonoids, phenolic phytonutrients, and phenol antioxidants in strawberries all help strengthen your skin cells. They’re low in sugar. They've even been shown to help improve cardiovascular health! 16 They're a delicious companion to this tasty, superfood punch. **If you want to experience LESS than 6 months of amazing benefits, please select from one of the other packages below. TROUBLE ORDERING? Try using these supported browsers: Firefox and Google Chrome. Click each box below to SEE your savings! Bumping up metabolism is key. It’s that feeling you get after walking up a flight of stairs. Your blood is flowing. You feel a warmth come over your body. That’s your fat burning furnace igniting! This recipe contains special antioxidants which can help you feel that way naturally, even while sitting at work! Anti-Aging Nutrients - Free radicals age you faster. They cause wrinkled, drooping skin. Good news: Antioxidants come to the rescue! They STOP free radicals. This slows the aging, before your cells are hurt. The serum of RED and dark ingredients you see below can help. They’re loaded with the precise antioxidants you need to STOP aging skin. They also help rebuild your collagen from sun damage and other aging signs. Think sharper. Improve your memory. Those are two of many bonuses from these unbelievable antioxidants. Years of free radical attack doesn’t just age your skin. It can slow down your thinking. Antioxidants can help. Never forget a friend’s name. Remember where you put your keys. Finally, impress your coworkers with your quick wit. It’s a welcomed side-effect to the superfood ingredients you’ll see below. No spike in blood sugar! That’s why we use a hot new superfood: monk fruit. It’s a natural, organic fruit sweetener used in eastern medicine for centuries. Scientists are baffled because it has ZERO calories. Taste testers say it’s 150 times sweeter than sugar. That’s why just 1 tiny drop goes a long way. An entire serving of this superfood punch has only 1 gram of sugar. We made it easy! It MUST be tasty, right? You’ll fall in love with this juice. We pride ourselves on making organic superfoods really taste delicious. Red Juice is a fragrant, delicious recipe thanks to the fresh taste of coconut, monk fruit, and ripe-picked berries. It’s easy to drink every day. You’ll feel yourself looking forward to a refreshing glass of nutritious Red Juice every morning. These are 11 of Mother Nature’s most powerful youth-enhancing superfoods. 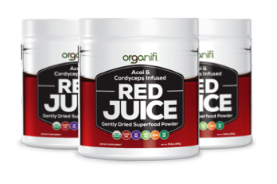 Each serving of Organifi Red Juice contains the perfect dose of each element - so every glass is as potent as it is delicious. Forget energy drinks: it’s time for Organifi Red Juice. By now, you see how important it is to get your daily superfruits consistently. But the time it takes to go shopping for fresh fruits, getting back home and peeling, chopping, dicing, and eventually juicing... it’s an ENORMOUS task. That’s why Organifi Red Juice is the perfect solution for our on-the-go lifestyles.